The robotic Cassini explorer circling Saturn was granted a mission extension until 2017 on Wednesday, as NASA engineers and scientists plot a daring end to the $3 billion mission that will take the spacecraft inside of the planet's famous rings. "I am very pleased," said Bob Mitchell, Cassini program manager at the Jet Propulsion Laboratory. "I can even say that I'm ecstatic about this." Cassini arrived at Saturn in 2004 to begin a four-year mission. The spacecraft's operations have already been extended until September 2010 as part of the Cassini Equinox Mission. Cassini dropped the European Space Agency's Huygens probe to land on Saturn's largest moon Titan in 2005. The orbiter has since flew past Titan nearly 70 times, adding to scientists' understanding of the methane-rich, cloud-covered moon. The mission extension until 2017 will permit 155 more orbits around Saturn, including 54 more flybys of Titan. "That Titan turned out to be so Earthlike was quite a bit of a surprise," Mitchell said. "In addition to the temporal variation, it's an opportunity to learn that much more about Titan, about what kind of active processes may be going on there today." Eleven more flybys of Enceladus are also on tap for the next 7 years. Enceladus is home to enigmatic geysers of water and organic materials originating from vents near the moon's south pole. Scientists believe the plumes come from an underground liquid ocean through surface fissures nicknamed "tiger stripes" in the polar region. Cassini has observed constant geyser activity since 2005, and researchers are interested in whether the plumes continue interrupted. "The big question is whether there's a liquid water source underneath the surface. All indications are that they answer is yes, but we have not definitively proven that yet, and if we could, that would be a rather exciting discovery because liquid water is one of the prerequisites for life as we know it," Mitchell said. If Cassini survives until 2017, it will have orbited Saturn for 13 years and observed the gas giant's system through a seasonal cycle -- from winter to summer in Saturn's northern hemisphere. "The extension presents a unique opportunity to follow seasonal changes of an outer planet system all the way from its winter to its summer," said Bob Pappalardo, Cassini project scientist at JPL. "Some of Cassini's most exciting discoveries still lie ahead." "The rationale for 7 years was that's what it takes to get to the northern hemisphere summer solstice," Mitchell said. "That will give us the opportunity to study seasonal changes as they vary , both at Saturn in its atmosphere as well as at the moons, Titan in particular." 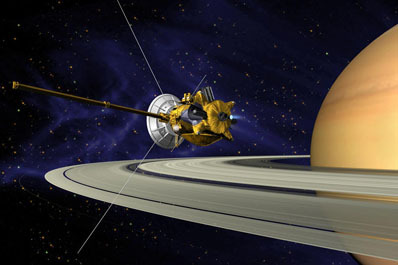 The 2011 NASA budget request includes $60 million per year to pay for the Cassini extension, which is called the Cassini Solstice Mission. "The spacecraft is doing remarkably well, even as we endure the expected effects of age after logging 2.6 billion miles on its odometer," Mitchell said. According to Mitchell, there is just enough propellant left on Cassini to complete the extension to 2017. "We've been fairly aggressive up to this point in designing the flight path in such a way to take full advantage of the science-gathering opportunities that we have," Mitchell said. "Now it's getting down to where we're not as flush as we once were." "Barring any anomalies that use up propellant, we should be OK to get to 2017, but at this point, I think we have little prospect of even planning to continue beyond that," Mitchell said. Mitchell's engineering and science teams are proposing moving Cassini's orbit closer to Saturn than ever before. 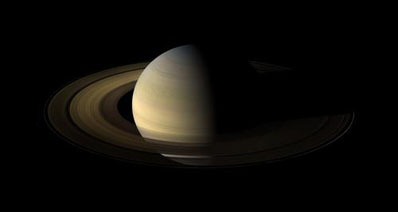 "In the last few months, we would have the closest point to Saturn occur inside of the rings, between the innermost ring and the upper atmosphere," Mitchell said. From the new vantage point, Cassini could make better measurements of Saturn's gravity, magnetic field and estimate the mass of the planet's rings. "The next question is what would we do with the spacecraft when we're all done," Mitchell said. "What we proposed was once we get in this close, then we would just lower it down into the atmosphere and do like the Galileo project did, and let the spacecraft be vaporized inside Saturn's atmosphere."